Different shapes of flowers are adapted to different insects. It is not a case of 'one size fits all', so plant a wide range of flowers in your garden. Choose types of flowers that are 'close to nature' in appearance rather than highly modified hybrids and horticultural forms. Exotic flowers from the southern hemisphere growing in our gardens may be visited by a few kinds of bees, but in general they do not support pollinator diversity. If you sit in a flowery garden on a sunny day you will notice that some insects visit a wide range of flowers while others have strong preferences. For their part some flowers seem to attract a wide range of pollinating insects while other types of flowers attract a very small range, or perhaps only one type of insect. On this page I discuss the main flower shapes and the sort of insects that each appeals to. Some flowers are wind-pollinated and insects play little or no part in their pollination. 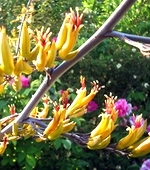 Typical of these are many trees, and Plantain (Plantago) and Meadow Rue (Thalictrum) amongst the herbaceous plants. However Willows (Salix) produce male catkins that are an important pollen source for bumblebees early in the season; and Thalictrum flavum (illustrated left) is a tall herbaceous plant that is used as a pollen source by bumblebees. Both of these have fluffy brush-like flowers that freely advertise their golden pollen. Open, bowl-shaped flowers generally have a ring of copious pollen in the middle of the flower. Examples include Poppies, Rock Roses (Helianthemum), Potentilla, Buttercups (Ranunculus spp.) and Wild and Shrub Roses. They are 'open access' flowers used by all sorts of insects. They are especially used by honeybees, bumblebees and certain solitary bees to collect pollen on their bodies by running round the inside of the flower in a circle. Bumblebees sometimes also vibrate their wings in such flowers to dislodge pollen, although this is not the same as 'buzz pollination' which I describe below. A number of flowers of this type do not offer nectar, so they are not visited by butterflies or moths. The illustrations on the left shows a small Mining Bee (Andrena) collecting pollen from a Buttercup, and below that a Buff or White tailed bumblebee worker collects pollen from a Welsh Poppy. Note the full 'pollen basket' on her leg. Lipped flowers typically belong to the Sage Family (Lamiaceae) or the Pea family (Fabaceae). 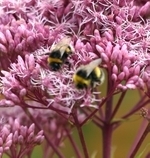 These are specialised flowers that in many cases have a close relationship with bumblebees or solitary bees. The lip at the front of the flower is the landing platform, the bee then pushes its head into the flower to get at the nectar which is secreted at the back of the flower. At the same time the plant places pollen on to the back of the bee's thorax (neck region). It is very hard for the bee to remove pollen from this spot, and in this way the bee carries pollen from flower to flower and ensures pollination. The Phlomis flower illustrated shows how this is done. Note the stamens poised to place their pollen on the bumblebee. Lipped flowers such as those in the pea family (Fabaceae) and Sage family (Lamiaceae) follow this pattern of specialisation. These lipped flowers usually have a 'landing platform' where a bumblebee or Anthophora bee can land before it enters the flower, as in the Lamium orvala flower pictured above. Members of the Pea family produce a very nutritious pollen that is vital for the growth of some species of Bumblebees; the wild flowers Bird's Foot Trefoil and Red Clover are prime sources and the loss of these two plants from pastures and meadows is thought to have contributed to the decline of several bumblebee species. Broad Beans (illustrated left) and Runner Beans are in this family. If you have plenty of bees in your garden you will get a good crop of beans. Members of the Daisy family (Asteraceae) are important sources of forage for insects. There are however different types of Daisy flowers that cater for different types of insects. Daisy flowers are in fact compound flower heads made up of hundreds of tiny flowers or 'florets' all tightly packed together. Some daises have a hard yellow button-like centre, consisting of tiny florets. These florets are too small for most bees and tend to attract a limited range of pollinating insects. The Inula pictured left has small florets which are mainly used as a nectar source by butterflies such as this Speckled Wood. In the next picture on the left a small Mining Bee (Andrena flavipes) is collecting nectar and possibly pollen from Anthemis tinctoria. Note the 'pollen baskets' on her legs. Anthemis tinctoria attracts a wide range of insects, especially small solitary bees. Many small solitary bees use yellow composites. As well as Anthemis and Helichrysum, Tanacetum (Tansy), Hawkweeds (Hieraceum) and Leontodon rigens will attract them. A third group of Asteraceae have flowers that are more brush-like. Many of these are coloured purple and they are excellent forage for insects. Forms of Knapweed (Centaurea), Globe Thistle (Echinops) and Eupatorium purpureum (pictured left) are typical examples, attracting bees, hoverflies, and Lepidoptera. Similar bunched flowers are found in the Teasel family (Dipsacaceae). Favourite types for insects include various kinds of Scabiouses, especially the Small Scabious, Scabiosa columbaria, and its very smart cream variety ochroleuca (pictured left, with a Drone Fly), the maroon Knautia macedonica and the Devil's Bit scabious. These attract Lepidoptera as well as bees and hoverflies. All of these can be naturalised in grass and will grow in a lawn, but the Devil's Bit flowers later than the other two and is best grown in a separate area. Mowing has to be adjusted accordingly. There are a number of plant families with small round flowers each with a small tubular centre. These appeal mainly to Lepidoptera (moths and butterflies) which push their long thin tongue into the centre of the flower to drink nectar. Typical examples are members of the Cruciferae (Wallflower family) such as Aubrieta (above left), and the Caryophyllaceae (Campion family) such as Dianthus (below left). Bee Flies, small bees and small beetles also sometimes take nectar from such flowers. A few flowers with deep tubes, especially Monkshood (Aconitum) and The European species of Aquilegia seem to have specifically co-evolved with long-tongued Bumblebees such as Bombus hortorum. Monkshoods have deep-throated flowers with nectar at the base of the tube. 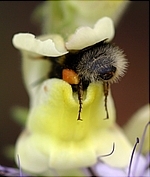 The illustration shows a long-tongued bumblebee visiting a wild form of the Antirrhinum (A. braun-blanquetii). The Carrot family (Apiaceae) includes small, flat open flowers in bunches called umbels. In general these present nectar openly and shallowly and appeal to hoverflies, small beetles and small solitary bees, rather than bumblebees or Lepidoptera. 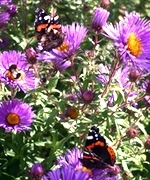 Outstanding among these for the pollinator garden are Angelicas (A. archangelica and A. sylvestris). The Sea Hollies (Eryngium) also belong to this family but have slightly larger florets that also appeal to larger kinds of bees. Some bowl-shaped flowers have nectar-producing organs (nectaries) at the base of the petals. Cranesbills (Geranium) such as the one pictured left possess this feature. A Bumblebee will insert its proboscis between the base of each pair of petals in turn to access the nectaries. Finally there are flowers which have evolved to make use of a special kind of pollen-collecting behaviour called 'buzz pollination'. The stamens form a pointed central cone which only releases pollen when Bumblebees visit and vibrate their wings at a certain frequency. Only bumblebees and Anthophora bees seem to be able do this; honey bees are unable to buzz-pollinate flowers. Familiar examples are Tomatoes, Peppers, Borage, and Geranium phaeum (left). Exotic plants - not insect-shaped! In other parts of the world various other types of creatures, especially birds, are important pollinators. This is not the case in Europe, where there are no naturally occurring bird-pollinated flowers. Typical examples of exotic flowers that co-evolved with bird pollinators include Fuchsias, Kniphophias, Phormiums, and Cannas, while the Australian Callistemons co-evolved with a mammal pollinator. Many of these flowers are not accessible at all to our insects as a source of nectar or pollen; others are accessible only to a very small range of robust insect species (typically honey bees and some of the commoner bumblebee species) and so do not sustain pollinator diversity. The image upper left shows Phormium with the robust infloresescence which serves as a perch for its bird pollinators back home in New Zealand. As well as having tall, robust inflorescences, orange and scarlet flower coloration is typical of bird-pollinated flowers. 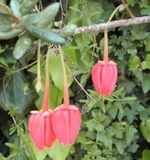 The image below shows the Chilean Lantern Tree (Crinodendron), a pendant scarlet flower typical of those visited by Hummingbirds in South America. Of course I am not suggesting these exotic flowers should be banished from our gardens. But we do need to ensure that we also plant an abundance and diversity of insect-friendly flowers in our gardens, so that the whole range of pollinating insects can get access to enough food to sustain them. Hebes (originally from New Zealand) are an exception to this general principle, as they have flowers almost identical in size and shape to those of the closely-related Eurasian genus Veronica and some Hebes attract a wide range of insects. What I have outlined on this page is a great simplification of a complex and nuanced subject.The term 'pollinator syndrome' is often used to refer to the general concept that certain shapes of flowers match certain types of pollinators. 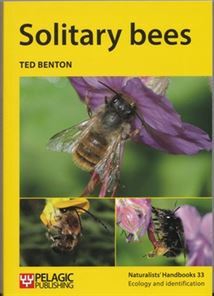 If you want to find out more, a good place to start is Chapter 5 of Ted Benton's book 'Solitary Bees' (2017). Covering all insects, not just bees, Benton gives a clear and concise summary of the concepts and issues involved.